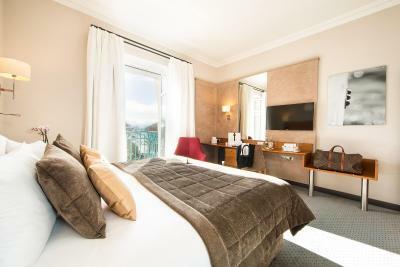 Lock in a great price for Impérial Palace – rated 8.8 by recent guests! The location of the hotel,restaurants and staff.Really we enjoyed our stay in the hotel and off course we will come back again. 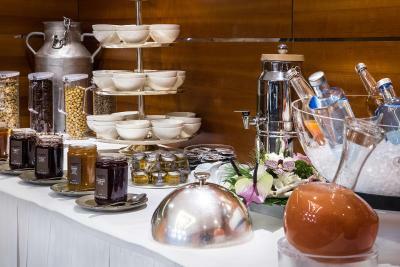 Great variety at breakfast including eggs made for you how you like them. Great location for the lake, Christmas market, Shops and Restaurants. 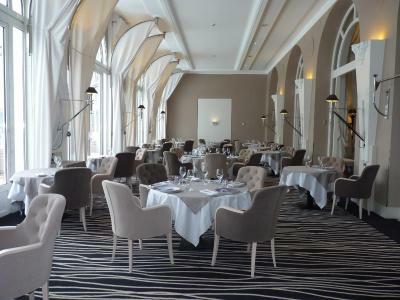 Excellent restaurant options - we dined in the Brassiere and had some lovely menu options. Beds were comfortable and so lovely to have a coffee and tea making facilities in the room. good place but dirty carpet room and other passege old elevator. 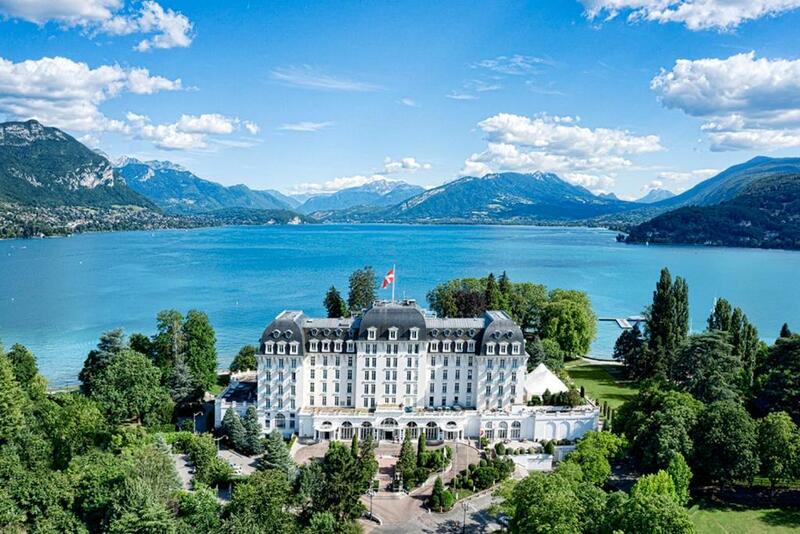 This is a grand hotel located directly on one of the most beautiful lakes in the world. It's adjacent to a park and beaches. 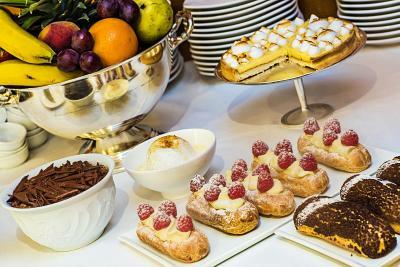 Their breakfast service was excellent with an opportunity to enjoy an al fresco setting viewing the grounds and lake. One of our top picks in Annecy.Located in the heart of the French Alps, Impérial Palace is a 4-star hotel is on the edge of Lake Annecy, 1 mi from Annecy's center. 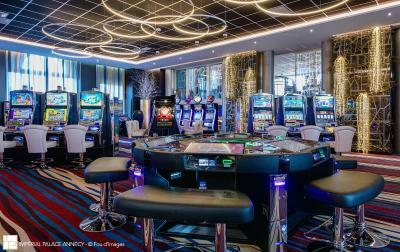 It offers air-conditioned accommodations, a spa and a casino. Free WiFi is provided. 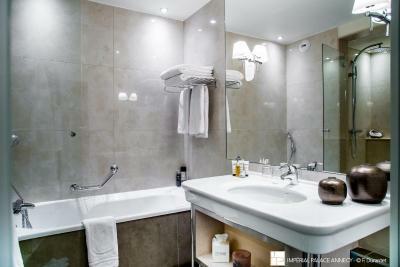 Each guest room at L'Imperial Palace has a mini-bar and a flat-screen TV with satellite channels. Most rooms also have a balcony with a view of the lake and surrounding mountains or park. A courtesy tray with tea is available in each room. 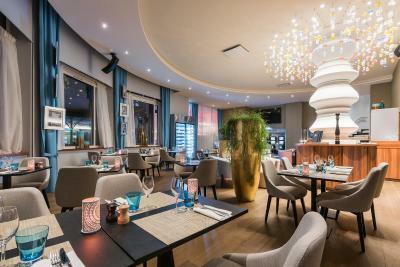 The hotel’s gastronomic restaurant, La Voile, provides traditional French cuisine. 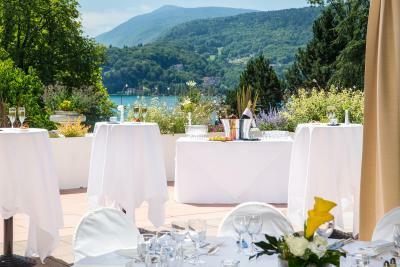 Meals are served on a shaded terrace overlooking the lake. 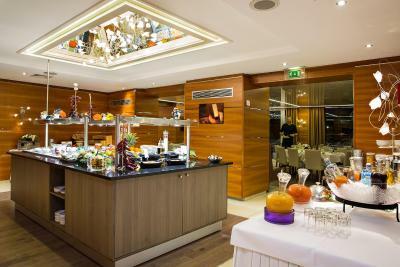 L'Impérial Palace also has a a more casual restaurant called La Brasserie, a bar, and a lounge where guests can enjoy homemade pastries, snacks and a full buffet breakfast. 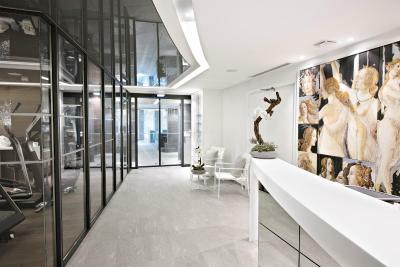 The onsite 1969 ft² spa includes a swimming pool, an experience shower, a sauna, a hammam, an ice fountain, a spa bath and private treatment rooms. 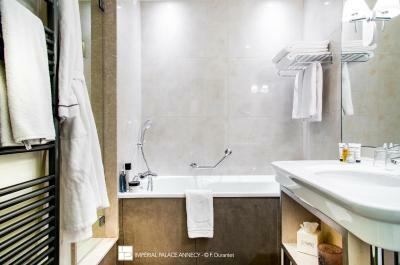 Impérial Palace offers also offers a business center. Free parking is available on site. Charging stations for electric cars are available at this property. 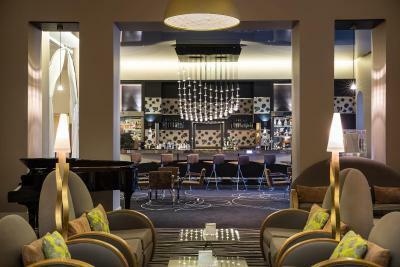 Geneva International Airport is 25 mi away and Annecy Train Station is 0.9 mi from the hotel. Annecy Château is 1.2 mi away. 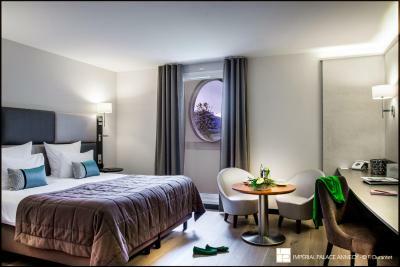 When would you like to stay at Impérial Palace? 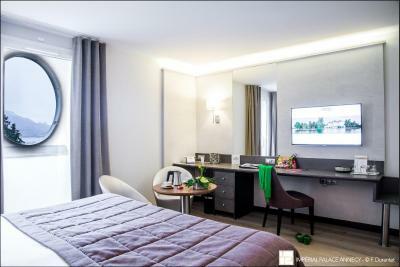 Features satellite TV, a minibar and tea and coffee-making facilities. Rooms with a view of the lake are for an additional fee and subject to availability. 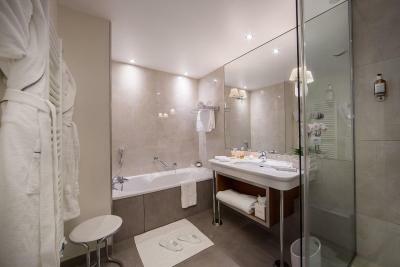 Features a minibar and a view of Lake Annecy. It also includes tea and coffee-making facilities. 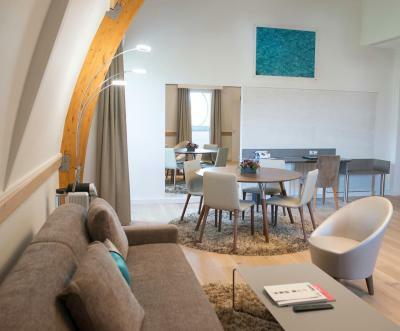 This suite features a bedroom and a separate living room. 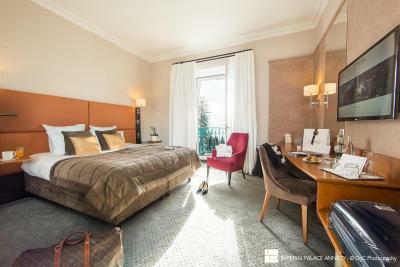 It offers views of the surrounding mountains and the lake, and a Nespresso machine is available. House Rules Impérial Palace takes special requests – add in the next step! Impérial Palace accepts these cards and reserves the right to temporarily hold an amount prior to arrival. 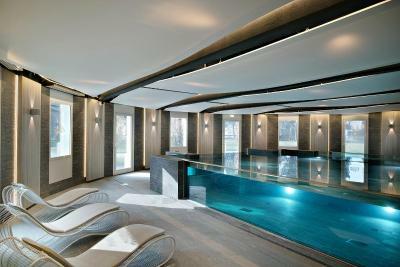 The spa and wellness center is open from 08:00 to 22:00. Children aged 13 years and younger are accepted between 16:00 and 18:00. This hotel is set against a picturesque backdrop of snow capped mountains and lake. Room was modern, large and had a lovely balcony. Food at the restaurant and bar was great, buffet breakfast was impressive. I stayed in a lake view room with balcony and it was amazing. The location of the hotel on the lake, made the view extraordinary. The customer service was beyond amazing, with smiley and helpful staff. The bed was very comfortable and the room very quiet. A real bliss for a quiet weekend. I definitely recommend the hotel. It is limiting for children to use the pool to swim. Our five year old grandson was only allowed in between 4 - 6pm. We hit poor weather with sleet and snow and it would have been a good option to occupy him, especially as he had come from Singapore and was jet lagged. We had poor weather and limited lake views because of mist and low cloud, so a few more options for children would be nice, but that is not their main market. Breakfast was buffet style but with plenty of options and there was an egg station if you wanted something freshly cooked. 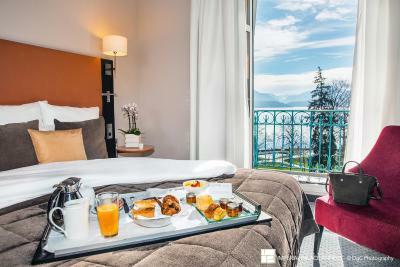 The location is excellent, right on lake Annecy and only a short - 20 minute - walk into Annecy old town, which is very attractive. There are lots of information signs around the lake with distances, times and suggestions of how to enjoy the area. Hotel staff very helpful, especially when we wanted to watch England rugby. Tuned the tv in the bar and got us comfortable seats. The only bad point could be if someone wanted to enjoy more the old city and to stay closer to its meandering streets - even though it is only 20 minutes walking by a beautiful path, it is not super close. The property is beautifully located by the lake with an incredible view of the mountain. It is only a short (and lovely) walk to the old town. I was upgraded to a lake view room and couldn't recommend it more. Breakfast was varied and full of options. 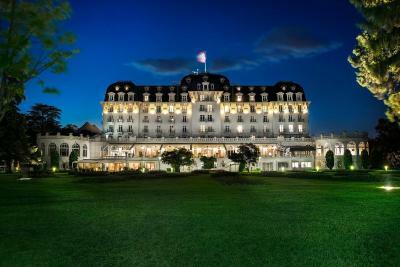 In general I loved my stay in Annecy and would come back to this hotel anytime. 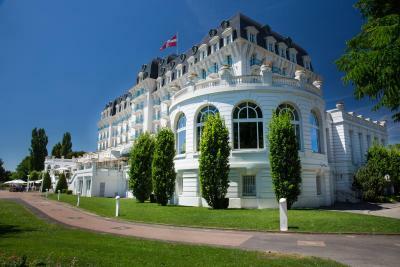 It is a magic experience to stay in a historical place in such an incredible setting. The breakfast is kind of simple, not many choices. Great location just in front of lake. Quite and nice spot. Room is big and very comfortable. The bath is quite relaxing. We regularly stop here when we are catching a flight from Geneva, it is less than an hour away. The staff are always obliging, the car is taken away to be parked and delivered for departure. They never seem to be phased when we arrive in ski gear from the slopes with various bags, which we amalgamate before departure. The rooms are spacious, the water hot, the beds comfortable and the restaurant whilst not the cheapest always provides good food. We will be back. Our rooms were tiny with no shower - 4 stars should mean at least a shower! We have stayed here many many times and these rooms on the eighth floor were not representative of the hotel or the price tag! Both Medium steaks severely over cooked. Location, beauty of building and helpful staff. It is a bit far from the old city. Usually it is not a problem, for we love to walk around, and the path is just by the lake. But it was cold and raining, and we couldn’t find a taxi (or uber) to take us back. We had to walk back. Not the hotels fault it must be said! But today, as a tourist, I would, maybe, have chosen a hotel in the old city.